What Is I Ching Hexagram 35 All About? 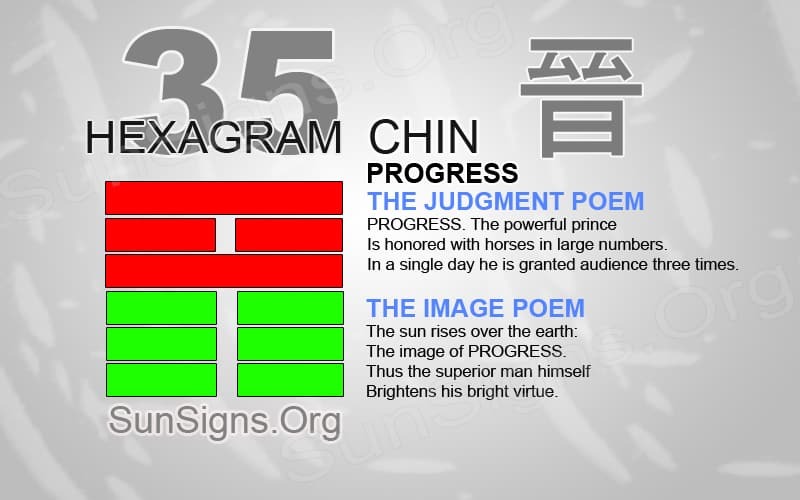 Hexagram 35 describes constant progress through both peaceful and trying times. Do not take each triumph for granted. During times of difficulty, an individual should keep the same mind frame when dealing with a pleasant situation. Hexagram 35 is a reminder of progress through different phases of life. There is almost no better feeling than when we are victorious over a difficult situation. Or, when a long term goal has come to an end. It calls for a time of celebration and a moment to cherish a coming to an end. There will be times when progress is successful, and great satisfaction comes from completing a difficult task. While during other times, a person can be dissatisfied about the current progression. In either circumstance, a person should have the same mindset to deal with both situations to have the best results. Have the same amount of joy during both good and bad times. This makes it possible to endure the difficult times. We should not continue to have amounting feelings of despair when life is not going our way. We then come to a standstill till we cleanse our inner thoughts. Life is about to progress into a new direction and now is the time to enjoy life. But during this great phase in life, it is easy to be carried away with this feeling of power and completion. Though this time should not be taken lightly. You also shouldn’t brag about it to others or continuously boast in a conversation. Others will take the time to enjoy this joyous time. But it is important not to make others feel lowly or unworthy of obtaining the same satisfaction. Use this time instead to encourage others to gain the same feelings of success. Learn to enjoy your love life when it lasts. When we are unable to enjoy life, we come down with disappointment in life. This can be both in love or the work area. These moments of unhappiness make it difficult to think clearly. And, can often lead to rash decision making to progress out of a tiresome time. Do not misuse this victory in career and work and use it for personal gain against others. Just because we are successful does not mean that we are then entitled to certain things. New opportunities should come our way when we show our strengths and determination. But to think a person deserves everything in life is a disaster way of thinking. Life will always progress and trying to control that progression is impossible. There are things we can do to secure a better life by planning and be able to adapt to life. But there is no way to control the future. In a single day, he is granted audience three times. Hexagram 35 yijing is a reminder that life is always progressing. Nothing will stay in the same place forever. Individuals should be willing to accept change and adapt to change when it occurs. This will allow for a smoother progression from one phase of life to the other. The time of great success radiates your feelings of joy with others. It helps you utilize the new power responsibly. When dealing with a difficult time of despair, remember your inner strengths. Use them to clear the conscious and overcome any obstacle.